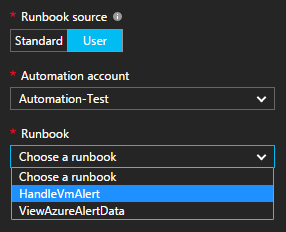 When you create an alert rule on a virtual machine, you can now choose to run a custom task (Azure Automation runbook) when the alert is triggered. 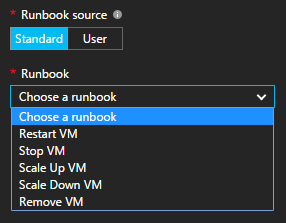 In March, we released the ability for you to choose a standard task, like restarting or stopping the VM. 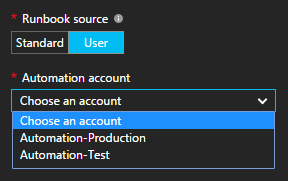 Today, we extend this functionality so you can choose one of your custom Automation runbooks to respond to the VM alert with your own workflow steps. Also, you can choose to vertically scale the VM up or down based on the VM alert rule. These two tasks have been added to the Standard task list: Scale Up VM and Scale Down VM. For more information about using Automation runbooks to respond to virtual machine alerts, see this article.